What is in the range bag of a 16-time Bianchi Cup Champion? 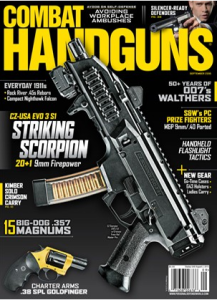 That’s what Combat Handguns Magazine asked Doug Koenig recently for their September 2015 issue. The issue reveals the six items Doug brings to every competition and gives readers the inside scoop on what it takes to stay consistent through the years. The article also includes a great video where Doug walks you through his whole range bag and equipment including his Leupold scope, Safariland holster, Hornady ammo, and the customization he has made to his Smith & Wesson DK .38 Super from the Performance Center. To read the full article, visit Combat Handguns online.